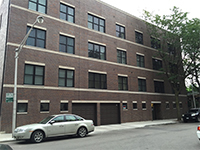 Chicago, IL – September 9, 2015 – American Street Capital (“ASC”) announced today that it has arranged $5.50 million in financing for a 24-unit apartment property in the Old Town community of Chicago, IL. The transaction closed in August, 2015. Quest Realty Group is a leading Chicago boutique property development and management company. Specializing in the development of mixed use condominium communities and rental properties in the most desirable neighborhoods of Chicago, they have successfully sold over $250 million dollars of real estate in their illustrious 13 year history.